Egypt's Zohr: Towards self-sufficiency in gas? 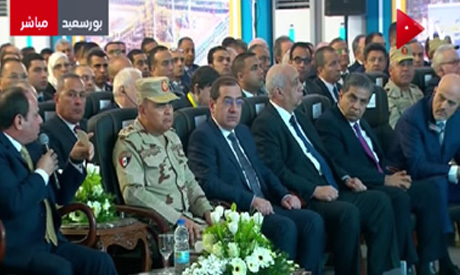 Egypt’s President Abdel-Fattah El-Sisi inaugurated on Wednesday the first stage of production at the super-giant Zohr gas field, which the country predicts will help achieve its goal of self-sufficiency in the supply of liquefied natural gas (LNG). El-Sisi praised the collaborative effort between several Egyptian companies, including Belayim Petroleum Company (Petrobel), a joint venture between the Italian-Egyptian Oil Company (IEOC) and the Egyptian General Petroleum Corporation (EGPC), for achieving the project's development goals. In attendance at the ceremony were various Egyptian state officials and Claudio Descalzi, CEO of the Egyptian company Eni, which discovered the field. In a speech, Descalzi said he was honored to attend the ceremony, calling the Zohr field a "fantastic discovery." Located 180km (110 miles) off the coast of Port Said and 1,500m deep, the gigantic gas field is the largest in the Mediterranean Sea. The CEO highlighted upcoming development plans agreed upon by Eni and the Egyptian government, noting that the Egyptian president had requested the Italian company come up with plans to expedite the project's conculsion. “Two years is a short period to execute such a giant project, and was not imaginable, however the Egyptian government’s cooperation through providing labor needs and facilitations contributed to achieving this,” he said, asserting that carrying out the president’s requests was the company's greatest challenge. “As a joint force, I was stunned,” he said, adding that the project’s first phase was only the beginning. "What we did is good, but there is more thinking in front of us... Let’s celebrate today, but let’s think of the future and the next step,” Descalzi concluded. From his side, Egyptian Petroleum Minister Tarek El-Molla shed light on the industry's difficulties before the 2015 Zohr discovery, saying that the country witnessed a suspension gas exploration due to political instability in 2011. “We saw a crisis in availability of petroleum products. In reality this was witnessed through lines [of cars] in front of gas stations,” he said, adding that the 30 June 2013 uprising was a turning point in terms of stability in Egypt's economic sector. According to the minister, an subsequent intensification of gas discovery and inspection took place between Egypt and its international partners. Egypt signed around 83 agreements for exploration and development since then, he added. "As of June 2017, we paid $2.4 billion in arrears owed to the international companies,” he stated. El-Molla pointed out that other recently discovered Egyptian gas fields, Nooros and North Alexandria, also offer opportunities to close the gap between Egypt's production and consumption. According to the minister, 16,000 direct job opportunities have already been provided, with 850 more expected by the end of the project. The inauguration comes nearly a month after experimental production began at the field at an initial 350 million cubic feet per day (mcfd), a test which had been planned shortly after the field’s discovery by Eni in August 2015. Field production would rise to 2.7 billion cubic feet per day (bcfd) by the end of 2019, transforming Egypt into a regional power hub. Total reserves of the field are estimated at 30 trillion cubic feet, according to El-Molla in earlier press statements. Production will increase to 1 billion cubic feet per day (bcfd) by June 2018, marking the end of the first production stage and granting Egypt self-sufficiency in LNG supply. The second stage is due to be finalised by the end of 2019 when production reaches 2.7 bcfd. According to Al-Ahram daily newspaper, investments in the first and second stages are estimated at $15 billion. Six wells are currently in use for production in stage one. That number is set rise to 20 wells by stage two, according to the minister. Eni currently holds 60 percent stake in the Shourouk Concession, which includes the Zohr field. Russia's Rosneft holds 30 percent, while British Petroleum (BP) holds ten. The Italian company will take up 40 percent of the field’s output for the recovery of development and exploration costs. Any excess production will be split between Egypt and Eni. Egypt was a net exporter of LNG until 2014. However, the country became a net importer in recent years due to declining output and power shortages amid political turmoil. In October, El-Molla announced that $27.3 million would be invested in three Egyptian natural gas fields – Zohr, North Alexandria, and Nooros – in the year 2018. The three fields are expected to increase Egypt's natural gas output by 50 percent in 2018 and 100 percent in 2020, according to the ministry.